In a new report, Highway Boondoggles 2, U.S. PIRG and the Frontier Group profile the most wasteful highway projects that state DOTs are building. Today we highlight Ohio DOT’s $1.2 billion Portsmouth Bypass, the most expensive and, arguably, least-needed transportation project in the state’s history. A major highway project that scored near the bottom of the state’s priority list is under way in a county, and a state, where driving has declined and existing roads are in desperate need of repair. 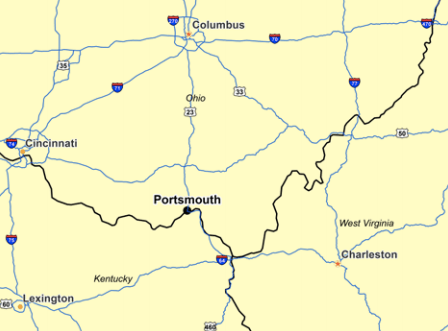 In June 2015, a private contractor for the Ohio Department of Transportation began preliminary work to build a 16-mile, four-lane highway bypassing Portsmouth, a 20,000-person city across the Ohio River from Kentucky in southern Ohio. It would roughly parallel State Route 335/489 from Sciotoville as far north as Shumway Hollow Road, and then cut northwest to Lucasville. The department claims no transportation outcomes or benefits, apart from allowing drivers to avoid several traffic lights, but nevertheless says the project would forestall feared future congestion at several intersections on U.S. 23 by building a road to draw traffic elsewhere. The Portsmouth Bypass, recently officially renamed the Southern Ohio Veterans Memorial Highway, would be among Ohio’s most expensive road projects ever and its first ever public-private partnership for highway construction. The corporate partner is the Portsmouth Gateway Group, led by a construction firm called Dragados, the company in charge of a multi-billion-dollar tunnel-boring project that stalled under Seattle in 2013. The construction is slated to cost $429 million, and the company expects to spend $557 million over 35 years of operating and maintaining the highway. State funds spent over that period will total $1.2 billion. The money will primarily come from taxpayer subsidies, in the form of direct government investment, government loans, and tax-advantaged bonds. Those subsidies would encumber future budgets, eating up money that could be used in the future for education, health care, and other necessities. 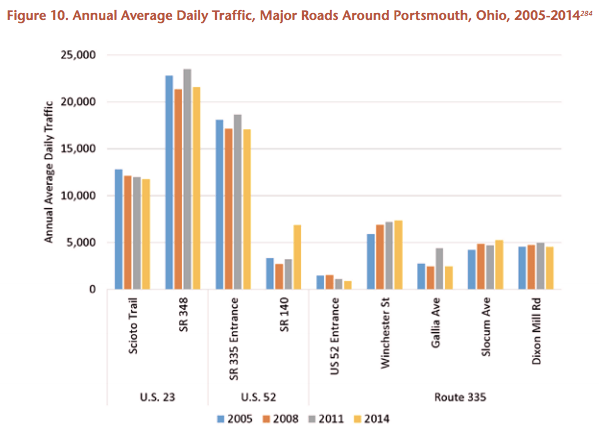 Building a new road is out of step with recent trends in Scioto County: Vehicle-miles traveled in the county fell an average of 0.2 percent a year from 2004 to 2014, according to state DOT data. Traffic on the roads that would be bypassed by the new highway has been stagnant for nearly a decade. The state has serious needs competing for its scarce transportation dollars. The Portsmouth Bypass is not one of them: It scored lower than all but three other projects statewide when reviewed in both 2011 and 2012. The state’s existing roads are also crying out for repair. In 2013, 15 percent of major Ohio roads were in poor condition, causing Ohio motorists to incur $3.3 billion – $413 each – per year in extra costs related to driving on roads in need of repair. In March 2015, local governments across the state begged the state transportation department to invest in fixing the state’s existing roads. Yet on March 31, 2015, the Federal Highway Administration announced it would loan the state $209 million for the project through the Transportation Infrastructure Finance and Innovation Act (TIFIA) program. And less than two weeks later, the state of Ohio signed a contract to begin building the road. The really crazy thing about this project, if I remember right, is that it will not receive any federal government grant money. Instead, the federal government funds will be a loan, that must be repaid by the State of Ohio, and that money will most likely come out of the general fund, not fuel taxes or other types of user fees. To me, this smells of political influence. Both of my parents grew up around Portsmouth, and I’ve visited many, many times. The city was a little industrial dynamo for decades–Jim Thorpe played football for the Portsmouth Shoe-Steels, the NFL team–but it has been shrinking and dying since the 1930s, its wonderful little downtown, which was bright and bustling in the 1920s and 30s, a mere shell of its former self. The city absolutely doesn’t need a new highway, but the city has been surviving on public money for years–first the uranium plant, then in recent decades the new health center, the new university, and now this last ditch effort, which is historically understandable (since Portsmouth rose to prominence based on its position on rivers and railroad routes) but is obviously pointless for all practical purposes. The $300 million Opportunity Corridor in Cleveland also no federal money essentially. All state/local money, all the state money borrowed. I don’t get why we wouldn’t be trying to match these funds 4-to-1 with federal funds, except that I guess Kasich and the politicos wanted to do them quick and they wanted to do it their way. Right. We lay out some of the financing here: A tale of two states: Comparing PPPs in North Carolina and Ohio (http://www.brookings.edu/blogs/the-avenue/posts/2015/06/30-ppps-in-north-carolina-and-ohio-sabol-puentes). Most problematic is who shoulders the risk; in this case the private partner gets paid irrespective of how many drivers use the road. -Largely incorrect. A TIFIA (federal) loan will be paid back by ODOT with a mix of state and federal funds. None of the money will be paid out of the state’s general revenue fund. ODOT receives very little funding from the GRF, and those funds are restricted for other uses. The vast majority of the Opportunity Corridor is being funded with bonds issued by the Ohio Turnpike. The debt service on the bonds is being repaid with turnpike tolls. There are many reasons why ODOT would not use federal funds (there may actually be some on the project, but not sure), but the most obvious reason is that there are no federal funds to be had. The first part of this statement is generally true, if by “taxpayer subsidies” you mean the state and federal gas tax dollars allocated to ODOT. The second half is completely false. The law expressly prohibits what is being suggested here. If ODOT spent state or federal transportation dollars on education, health care, etc., it would be violating The Ohio Constitution, as well as Title 23 of the United States Code, respectively. Point of Clarification: The Shoe-Steels were a semi-pro team. The Portsmouth NFL team was the Spartans, now the Detroit Lions. Yeah , that’s true! I was writing the comment on my phone while walking, and forgot. It’s been a while since i’ve thought much about Portsmouth! Haha fair. It’s some pretty obscure trivia! Yeah I understand that. Turnpike bonds. State money still. There are a small fraction federal but pretty much nil. And bike lanes are useful in diverting truck traffic to a rural area.